The availability of mobile technology, acceleration of computing power, and advances in analytic techniques in recent years have boosted optimism in the quest to help the 3.6 billion or more people worldwide who lack access to essential health services. The central question is how we create learning systems and use technology to harness medical knowledge and reach, treat, and sustain engagement with patients so they get the best possible care wherever they live. A lot of organizations in the health sector … have grown up focusing on data as a means purely of monitoring and evaluating. “Technology is key to unlocking the benefit of the Fourth Industrial Revolution for health care; it is an essential tool in leveling the playing field and give equal health care for all,” said Vanessa Candeias, head of the Global Health and the Healthcare System Initiative at the World Economic Forum. “We’re looking at how technologies can be a tool for inclusive access to health care and not a tool for increasing inequalities,” she said, adding that such technologies needed to fit a specific need and emphasized the importance of developing them with an emerging market context in mind. 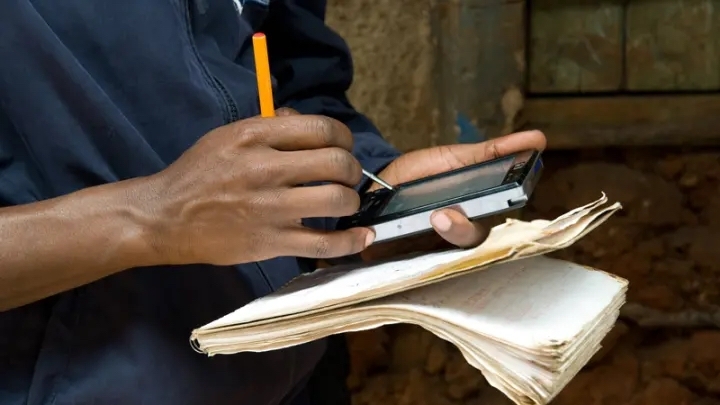 The proliferation of mobile technology in Africa — with over 440 million devices in sub-Saharan Africa alone by the end of 2017 — has been connected to opportunities to leapfrog legacy technologies across multiple sectors, including health care. Real-world opportunities are numerous — such as connecting health care workers to the wider network of medical evidence — while e-health, smartphone-compatible devices, and remote surgeries are emerging to help improve service delivery. Frontline health workers don’t need to be more analytical, they need to be supported in delivering a quality service. Data in and of itself is not inherently useful, it needs to be coupled with clear recommendations and steps for action to guide real impact. But despite the promise, the connection between technology and operational impact on the ground has often been missing. Technology and data provision are merely enablers: people need to be convinced to get engaged and understand how to use them. “Real-time data doesn’t necessarily mean a transformation of insight or a change in behavior; it may just mean that you’re inundated with more and more data, which actually can be quite counterproductive,” explained Alan Kalton, chief commercial officer at BroadReach, a global health care solutions company. If progress is to be made on Sustainable Development Goal targets such as universal health coverage, leaders and staff alike need to be empowered on the ground with the information and tools needed to serve their populations. Each has specific needs with a requirement for technology solutions that help solve challenges. This calls for a different approach. Frontline health workers don’t need to be more analytical, they need to be supported in delivering a quality service. Data in and of itself is not inherently useful, it needs to be coupled with clear recommendations and steps for action to guide real impact. Reinforcing existing practices will not bring the kind of change needed, Kalton explained. “You have a lot of organizations in the health sector that have grown up focusing on data as a means purely of monitoring and evaluating,” he said, adding that this is often done “in a retrospective and descriptive” way. Although this type of evaluation is important, the real game changer will be the use of data to become prescriptive, developing and pushing actions, and triggering workflows constructed from proven guidance to health care workers. This will enable health care workers to focus and accelerate their skills and experience. What is important, Kalton said, is to use technology to move beyond simple data collection, analysis, and technology deployment, and instead embrace the need to deliver predictive recommendations to health workers so they can focus on their jobs rather than becoming “virtuoso data analysts.” Technology is only part of the solution, it must be coupled with process reengineering and change management if it to be relevant, useful, and adopted by a workforce. Kalton said BroadReach and its team of consultants, for example, work with clients to implement a solution that can empower the health system to make better decisions that will lead to actions. For real impact, he said, these actions need to be implemented across the health care system in a replicable way. And that’s where technology comes into play: BroadReach uses Vantage, an intelligent technology platform that connects powerful analytic-driven recommendations with proven workflows to empower health care workers with the tools they need to create greater impact consistently and at scale. “We don’t want health care workers with critical life-changing skills to spend the first half hour of their day doing analysis, reviewing the data, and going through masses of data processing,” Kalton said. He added that while Vantage itself uses complex analytics to extract maximum value from data, it also allows simple engagement with medical workers to help give the best possible treatment to patients. Victoria Mubaiwa, chief director of strategic health programs at the Department of Health in South Africa’s KwaZulu-Natal province, has first-hand experience of how technology can enable management of large-scale health programs. She believes systems that aid human resources could be key to helping give health workers and facilities their daily targets and monitor whether they are meeting them. Through the partnership with BroadReach, Vantage was implemented in her province in 2016 and the Department of Health has reaped the benefits of more sophisticated and granular information to plot results and plan actions. “It shows us where we have gaps in allocation of staff and where we are over-resourced so that we can make efficient use of the existing limited human resources that we have,” she said. KwaZulu-Natal province has one of the highest HIV infection rates in the world, so it is crucial to bring this under control. But tracking other diseases has also been boosted by using Vantage, Mubaiwa said. For instance, the ability to monitor whether facilities were meeting immunization targets after a measles outbreak last year facilitated a rise in immunization coverage from 70 percent to 90 percent and stopped further outbreaks, she said. A key factor underlying such improvements is the hand-in-hand improvement in general systems and patient administration across the region’s over 750 clinics and hospitals. Previously, a manual paper-based and Excel system captured data for review on a monthly basis, but now this happens weekly in electronic format. That makes it much easier to see whether weekly targets for testing and treating HIV have been met at different facilities, Mubaiwa said. “[The improvement in general systems and patient administration] has changed the culture of using information for management. It makes managing the campaign so much easier and the response to challenges much quicker,” she said, adding that the respect for the use of information has naturally translated to quality with nearly every facility reporting complete information weekly, and an ever-expanding application to new disease areas. Mubaiwa said people are now coming to understand the importance of the quality of data, not simply to give head office information for reports, but to actually manage programs and ultimately help treat patients. A key factor for technology use and sustainability is when governments themselves have a strong framework for reforming their health care systems and technologies can be adapted to it, said WEF’s Candeias. “That makes a big difference when you have governments putting forward the demand and technologies being fitted to the need,” she said. “Shoving a technology into a specific health care system doesn’t work,” she said, adding that projects could also be hard to scale if they were not set up with a business plan up front. Candeias said that the INFUSE program of Gavi, the Vaccine Alliance was a good example of successfully identifying innovators, exposing them to a broader partner network, and then helping mobilize new technologies with the private sector; another example was the Stop TB Partnership’s venture capital fund Accelerator for Impact. She also highlighted the need to continually assess whether technologies are helping patients and ensure that these technologies can be integrated without putting people at risk of financial hardship. But if technologies can serve a particular purpose and become almost second nature to the people using them, they stand to bring big benefits. The key, said Kalton, may be to think of data and technology not just as tools to report on the past, but for looking forward and really putting users at the center. Think, for instance, of the convening power of a predictive early warning system for infectious diseases coordinating between states to quell the next outbreak of Ebola. In this way, the intersection between technology and information could have exciting applications for health delivery. Click here to read the full article on Devex.